This was the book my darling little dog chewed on two weeks ago. Too bad because it's definitely a book I'd like to keep and reread someday. Good thing I got it from the used bookshop but it was in such good condition that when I got it, I felt it was a steal for being in very good/brand new condition. It's about four mothers who found friends in each other - who drew strength from one another to survive their own little earthquakes. Of course I identified with Becky, a big woman who was happy and sure of herself. She had a near-perfect husband, and she was doing something she loved for work. Of all four friends, she seemed to be the one who was on top of things, she brought the most laughs and made the most sensible decisions. Even her mini crisis wasn't so dramatic though issues with a mother-in-law are definitely serious business too. I am not her and my life isn't nowhere near hers, but she could be a mom and wife I'd like to be when I grow up. When I do get pregnant, I'll read this book again, and brace myself for motherhood and all that a baby would bring into my life. Along with What to expect when you're expecting, I think this should be a must for every expectant mother. Plain, practical, non-glorified view of having a newborn. 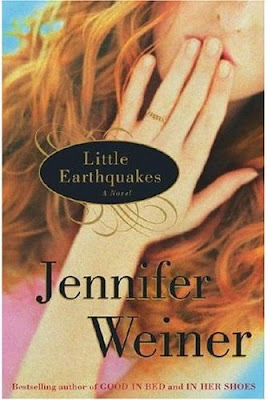 Along with Weiner's Good in Bed, Little Earthquakes is definitely one of my favorite books of it's genre. It's one of my favorite books. Period. Great book! I met the author and she is such a fun and down to earth person. She was at a book signing in Chicago and I ended up bumping into her at a Starbucks and she stopped to talk!